Despite the fact that they’ve been kicking around the underground for 12 years, I’d never heard of Skelator until I came across some metal distro site (can’t remember which). Hey, any band with a name and album cover based on Skeletor automatically has a few cool points. The samples sounded decent as well and I was looking for a new band to try so I eventually ended up ordering this album. Sadly, when I got it in the mail there was no jewel case. The CD, booklet and back cover were all in one plastic slip. Odd, especially since I didn’t see it being listed as shipping without a jewel case but I guess it’s okay since I have some jewel cases to spare. 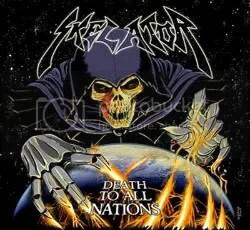 Anyway, self-described as a mix of “epic heavy metal” and speed metal, Skelator plays in a mixed ’80s metal style: traditional heavy metal, power metal, speed metal. There’s really nothing new going on here. It’s all just no-frills metal influenced by the usual suspects of said subgenres (Priest, Maiden, Sabbath, Manowar, Dio, etc.). I’ve read some comparisons of singer Jason Conde-Houston to Rob Halford and while that’s a bit off base, Jason does indeed have a great piercing scream. While the rest of his vocals are fine, he certainly doesn’t carry himself like Halford does while working with a lower register. Enthusiasts for traditional heavy metal and retro metal bands will probably enjoy this one. I like it but I had to give it a few spins to get hooked into it and that’s when songs like “Victory (Henry V)”, “Symphony Of Night”, “For Death And Glory” and “Death To All Nations” started to appeal to me. With the last three mentioned songs, I can definitely get why the band describes their brand of metal as “epic”! There’s some great musicianship and vocals all over those songs and there’s enough interesting changes so that you’re not bored by the length of the songs. And what’s a metal album without an anthem to rally behind? Well that’s why “Stand Up (For Rock And Roll)” is here! My initial thought on this album was that it was bland traditional metal. Though the album isn’t a knockout, there are a handful of notable moments. It isn’t a must-have but any fan of the traditional style will probably get their money’s worth out of this album and I’m more than happy to put my money towards a mostly unknown metal band upholding old metal values.